A view of the playing floor from the top of the temporary stands. If you're looking for the Streetcar Named Desire, you're be out of luck at this year's Final Four in New Orleans. But if your desires include good food, drink, jazz and perhaps some antique shopping, start rooting for your team to make it to the NCAA Men's National Championships on April 5 and 7, 2003. 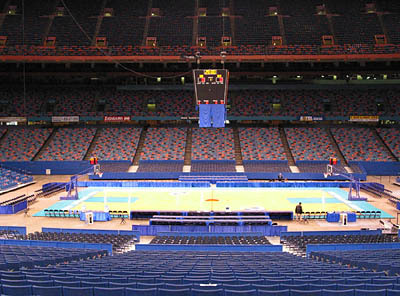 The Louisiana Superdome will host its fourth Final Four (others being 1982, 1987 and 1993), marking the eighth time it has hosted a Regional or Championship Game since it was built in 1975. A recent walk through with the NCAA in early December revealed plans for the layout of the arena including workspace for TV, writers and photographers. I'll try and give you a look at the facility and where you will be working if your school gets there. The photo work area will be steps from the arena floor and is easily approached through the ground floor media entrance to the Dome on Poydras Street, which is the Gate A side. Pipe and drape will separate the area of tables and chairs where most of us will process our digital images. Yes, I said us. SI is planning to do its first all-digi Final Four. A cable feed will be provided, but if you really want a TV set near your editing area, you need to bring one. Wouldn't want to miss 0ne Shining Moment! The temporary stands will be removed and no fans will be sitting near the photo work area. There will be plenty of electrical power in the photo workroom. Telephones are generally ordered through a contractor, which has been GTE, and an order form comes with the credential application. Pay attention to the credential application form that usually goes to national newspapers, magazines and selected big city dailies --- it is often is sent addressed to the sports editor. It's important that you coordinate to make sure the photography end of things is sorted out properly. If you think you want to send an editor along with a shooter, apply for that and cancel later if your need to make a change. While the editor does not get floor or shooting access during games, getting an extra credential at the last minute can be very difficult. As we've done for the past several years, AP and Reuters will get all the credentials allocated for photo messenger and take care of getting disks from the floor and upper shooting positions to the photo workroom. The writers and interview room will also be on ground level, but across the dome floor and under the stands. The interview area will be across the hall from that workroom. 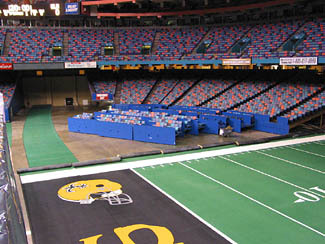 CBS will park its trucks on the dome floor behind the temporary stands, next to the photo area. 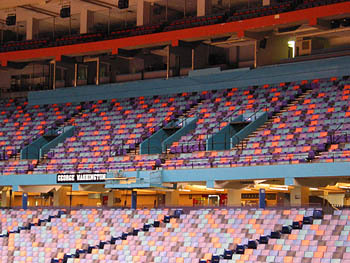 Upper positions are above the vomitories on the permanent seating side of the arena, facing the benches. Our Bob Rosato estimates it's about a 600mm throw on a digital camera and you may want to be tighter than that. If you are in an upper position, you'll need a short stool or a lens case turned on its side to sit on. You cannot sit on anything very high or you will block fans. Two shooters can sit in each position. Boards are placed above the vomitories to seat photographers. Two can be in each position. have some height in the back row. Generally, papers covering their local team will be seated in the front row for their game, then the back row for the other semi-final game. If your team is there Monday night, some slight reshuffling will occur but you will generally get at least one front row seat near where you were. Generally, positions are laid out to accommodate two rows of 12 photographers on each end. Two SIDs from schools not involved in the tourney sit with the shooters at either end and distribute armbands, rosters and generally monitor activities during the games. These SIDs can help you with any problems you have on the floor and my experience has shown it's best to deal with them rather than engage the event security people. There are three sets of strobes allowed at the Final Four (and at each 1st/2d Round and Regional sites during the tourney): One for Sports Illustrated, a second set shared among AP, Reuters and USA TODAY and a third pool set for use by newspapers, other magazines and NCAA photos. SI installs all three sets at the Final Four site because we have the lights, techs and ability to get it done reliably, with redundancy in case of problems and with uniformity to satisfy CBS for the lighting tests. Each user of lights in the pool is charged a pro-rata share of their time on the lights, and in New Orleans that will be substantially more than usual because of the extremely high catwalks and amount of time, equipment and power needed for the job. SI's techs will arrive the Monday before the semis to begin the installation, which must be ready for a lighting test for the NCAA and CBS by noon that next Friday. You don't really need a rental car in the Big Easy. The media hotel will be the Hyatt across from the Dome, now separated by a shopping complex. The 18-mile cab ride from Louis Armstrong New Orleans International Airport will take about 20 minutes as long as I-10 is moving along, and will cost you $28 to what they call the Central Business District. There is also a shuttle service from the airport for about $20 per person roundtrip. Once downtown, you can walk almost anywhere, especially from the Hyatt, to the French Quarter or the riverfront. Cabs downtown are plentiful from outside hotels and aren't that expensive between downtown points. Everyone has a favorite restaurant in New Orleans, and my new one just became Cuvee. But my old standbys are Commander's Palace in the Garden District and Arnaud's. I also encourage you to visit A Gallery for Fine Photography at 322 Royal St. There are always a display of vintage photos on the walls, as well as some wonderful old and new photo books. You can easily lose a couple of pleasant hours here. So, unlike Stella in "Streetcar" you may not have the mean old Stanley Kowalski chasing after you, but you will find that the streetcar takes you up St. Charles Avenue to the Garden District, Tulane and Loyola Universities and the beautiful Audubon Park. And you'll find charming folks who know how to "Laissez les bons temps rouler."